Mark James has a one stroke lead after the first round of the ISPS Handa PGA Seniors Championship. 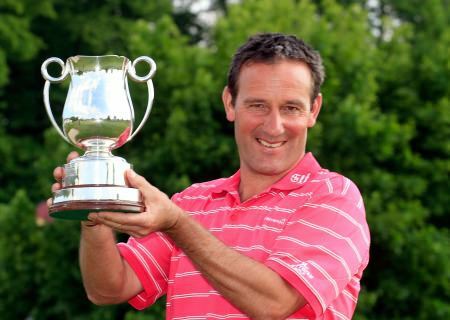 PIcture ©Getty ImagesEamonn Darcy was the top Irishman as former Ryder Cup captain Mark James posted his fourth consecutive round of 67 to lead by one stroke following the first round of the ISPS Handa PGA Seniors Championship at De Vere Slaley Hall, writes the European Senior Tour. The Englishman was joint runner up behind Gary Wolstenholme in last week’s Benahavis Senior Masters with three straight rounds of 67. After starting on the tenth tee on the Hunting Course, he continued that sequence, carding six birdies before dropping his only shot of the day on the challenging closing ninth hole as Darcy posted a level par 72. At five under par, James leads by one from compatriot Bob Cameron while Des Smyth and rookie Philip Walton are seven shots off the pace after 74s. “It’s a nice number to be stuck on, 67, isn’t it?,” 58 year old James said. “I played great today. It’s one of the very few good rounds I have shot around this course and I felt very much in control. “The few bad shots I hit, I got up and down well, so I’m very pleased. The stroke felt good today. James, an 18-time European Tour champion, is searching for his first European Senior Tour win since defeating Darcy, who is still searching for his first senior tour win, in a play-off in Mallorca in 2009. And he attributed his recent form to an improvement in his putting stroke. “I suddenly started putting well on the last day last week,” he said. “It came out of nowhere really. Today the stroke was great. It felt simple, from three feet it felt pure, easy and rhythmical. That’s not that normal for me. It makes a huge difference to my game if I start putting well. “I’m coming off two very bad years with the putter so it’s a good sign. I read a really good book by Bob Rotella which said if you hole putts on the putting green and miss them on the course it is mental, but if you can’t hole them on the putting green it is technical. Cameron, who also posted six birdies in his round of 68, recorded his joint best finish of 2011 in this event last year, sharing fifth place, and he is hoping for another strong performance this week. “I’m extremely pleased to be four under after the first round,” said the 59 year old. “I nearly dropped a shot on the last but managed to hole a swinging six footer, so I’m very pleased. Englishman Jeff Hall briefly joined James in a share of the lead but bogeyed his last two holes – the eighth and ninth holes – to drop back to three under par following a 69. Six-time European Tour champion Anders Forsbrand is one of six players tied for fourth place on two under par, while defending champion Andrew Oldcorn, who won by nine shots 12 months ago, opened with a level par 72 for a share of 16th position, alongside former Ryder Cup player Barry Lane and 2011 Order of Merit winner Peter Fowler. Ryder Cup vice-captain Des Smyth holed a snaking 25 birdie putt on the 18th green to take the early lead at the ISPS Handa Seniors PGA Championship at the Stoke by Nayland Golf, Hotel & Spa, writes the European Senior Tour. Des Smyth is a great bunker player. 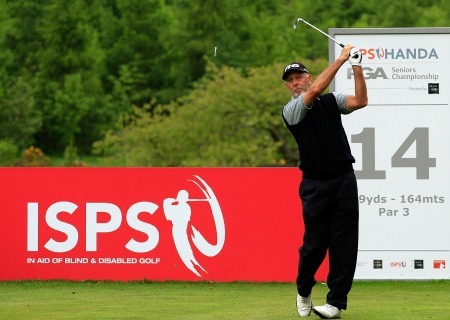 Picture by Phil Inglis/Getty ImagesDes Smyth saw a potentially brilliant first round of the ISPS HANDA PGA Seniors Championship suffer a near knockout blow over the closing holes at De Vere Mottram Hall. Des Smyth. 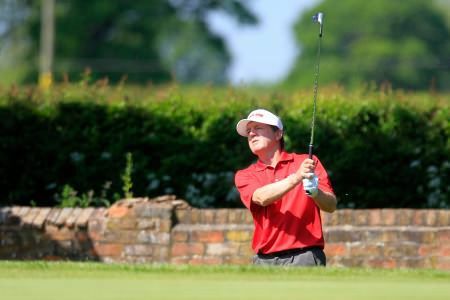 Picture by Getty ImagesDes Smyth might be making silly bogeys but his haul of 15 birdies over the first two days has left him him clear of the chasing pack in the ISPS Handa PGA Seniors Championship at de Vere Mottram Hall. Defending champion Paul Wesselingh leads by a shot at De Vere Mottram Hall. Picture: Gettty ImagesDes Smyth is hoping the back nine will finally be kind to him in the final round of the ISPS HANDA PGA Seniors Championship. Paul Wesselingh with the ISPS Handa PGA Seniors Championship trophy. Picture by Getty ImagesDes Smyth carded a second successive 73 to finish 10 shots behind runaway winner Paul Wesselingh in the ISPS HANDA PGA Seniors Championship.